Concepts of Database Management 8 Edition Delivering concise, cutting-edge coverage, CONCEPTS OF DATABASE MANAGEMENT, 8e uses real-world cases, examples, and illustrations to give students a thorough understanding of such critical issues as database design, data integrity, concurrent updates, data security, and more. Completely updated to Microsoft Access 2013 standards, the text presents SQL in a database-neutral environment and covers all major topics, including E-R diagrams, normalization, and database design. It provides detailed coverage of the relational model (including QBE and SQL), normalization and views, database administration and management, and more. Advanced topics covered include distributed databases, data warehouses, stored procedures, triggers, data macros, and Web Apps. 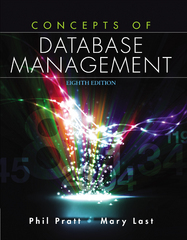 Ideal for an introductory database course in an information systems, business, or CIS program, CONCEPTS OF DATABASE MANAGEMENT, 8e can be used in varying disciplines by instructors who want database coverage without using a trade book or a large academic book.